My name is Christopher Taylor, but due to there being many other Christopher’s in my school, almost everyone I know calls me Taylor. That’s a circuitous way to tell you my name, and my path to becoming a tour guide in Berlin was just as circuitous. I grew up in a tiny town in rural Australia (Finley- Population: 1,900 people). I have an educational background in Computer Science, Film, Theatre and Finance. However, my true love is modern history and it was for this reason that in 2009, I decided to spend a few weeks in Berlin. I soon realised that a few weeks would not be enough and I’ve now been a very happy Berliner for nearly eight years. I am first and foremost a story teller; I want to share the funny, the harrowing and the obscure stories of Berlin, delivered with drama, passion and respect. 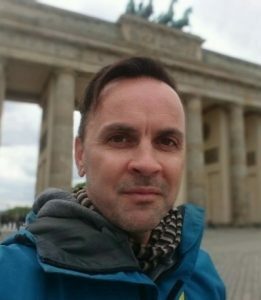 I have been a tour guide in Berlin for over seven years and in that time I have refined a range of tours, discussing the dark 20th century history of this amazing city and also its rapid changes over the hopeful last three decades. I am also happy to “Taylor Make” a tour catering to your personal interests and desired activities. I am currently designing a bike tour of the entire path of the Berlin Wall.